As the San Diego Padres were taking batting practice ahead of a game at Dodger Stadium last month, a couple of spectators were arguing about one member of the visiting team. “They have someone on their team who was born in Okinawa,” the woman said in Japanese. The coach in question is the always affable Dave Roberts, who in his three years as a Dodger and playing days at UCLA before then, forged a great many alliances here in the L.A. area. 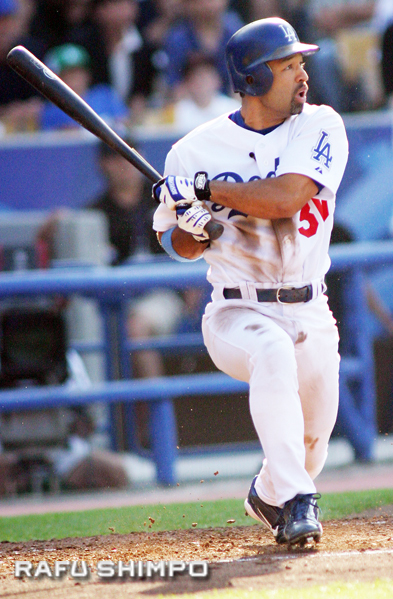 On the broadcast that night, Dodgers announcer Vin Scully introduced him as “Our old friend Dave Roberts,” as he took his position in the first base coaching box. On the field during batting practice, Roberts spotted me and hopped over to give me a warm embrace. Looking fit and as energetic as ever, Roberts said he’s in good health, after undergoing treatment a few years ago for lymphoma. 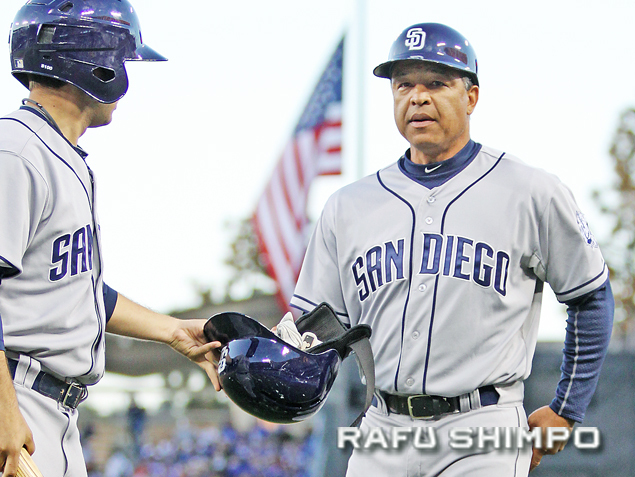 Roberts serves as Padres manager Bud Black’s first base coach, but he brings a wealth of knowledge to a team that has struggled offensively the last few seasons. Perhaps best of all, Petco Park is a quick drive from home. “San Diego’s my home, and being able to see my kids every night is very special,” he said. Roberts’ name will be forever linked to the World Series championship run of the Boston Red Sox in 2004, for a single play. In his only appearance in the American League Championship Series against the rival New York Yankees, Roberts was inserted as a pinch-runner in the ninth inning, trailing the Yankees by a run, down to their last out and facing the game’s best closer in Mariano Rivera. Everyone in the stadium and those watching across the country knew exactly why the speedy Roberts was in the game: to steal second. And by a margin of centimeters, that’s exactly what he did. Roberts came around to score and tie the game on a base hit, and the Sox went on to stun the Yankees to win the pennant, continuing on to end more than 80 years of futility by defeating St. Louis for the championship. Sports Illustrated put “The Steal” at No. 2 on its all-time list of most important stolen bases, second only to Jackie Robinson swiping home in the 1955 World Series. Because of his history in Beantown, Roberts said his heart was aching as a result of the bombings at the Boston Marathon, which had occurred two days earlier. Looking toward a brighter future, Roberts was somewhat candid about the prospect of becoming a manager himself someday – possibly soon. He reported that his family are all well, and that his parents will soon travel to Okinawa to visit his mother’s family. He let out a huge laugh when I commented on his fitness and asked about a possible return to playing.